mAh per display square in. 200mAh/sqrin. This Go Edition phone dons a wide yet low-caliber 5-inch 18:9 display sitting on a 960 x 480 FWVGA+ sharpness, while it promises only up to 15 hours of continuous standby time with its malnourished 2000mAh battery. To wrap it up, it runs on Android Go, rigging it with a bunch of optimizations tailored to smartphones that use its kind of low-end hardware. On-paper Pros & Cons Alcatel's 1C 2019 caters to first-time users with specs like a 5-inch 480p display and an 8GB-only memory, while running on the efficiency-driven Android Go ecosystem. We study its pros and cons here. 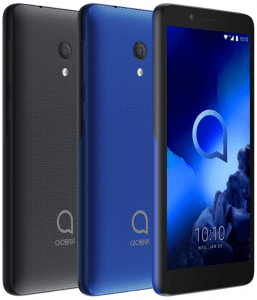 (more) Alcatel phones 2019 View all the most recent Alcatel phones.